We can find the word "Fuji" in many Japanese. The popular TV station is called "Fuji TV", lots of "Fuji-mi", meaning "see Fuji" (Fuji-mi Zaka -> the hill where you can see mt.Fuji),… I can think our ancesters have loved mt.Fuji. I once climbed to the top of there to see the sun rise. After two hour way, the bus arrived at the half point to the top. It was around six o’clock in the evening. a walking thru the night until midnight. The sun rise from the top was exciting view. more than that I still remember the fun jumping down walk on the back way. 2. The angle of mountain Fuji is needed to exaggerate so that anyone can understand what you draw. Start with thin line and at the middle of the ridge, push the brush and throw it down. The shaft of the brush and the line direction goes toward the same way whereas the surrounding mountains are drawn by the side slide. 3. The shade of the hill: first light move and push, then run. Carp… are you guys familliar with it? I saw them in the dirty river, "Kanda-river" in Tokyo downtown where I was raised. Nishiki-goi, colourful ornamental carp, are one of items which reminds us of Japanese cerebrity life, was creative breeding work in sixteenth century in Niigata pref., the northern area in Japan. Nishiki-goi swims gourgeous like kimono girls. very fun to see. Some might hear about Chinese old saying, carp turns out dragon climbing the waterfall. We say To-ryu-mon, literery climb, dragon, gate, for the new comer contest. American Idle is kinds of to-ryu-mon of artists. I draw this inspired by the old sixteenth carp painting which I bought in London. 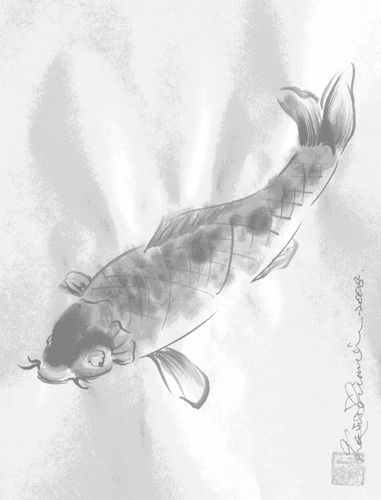 The wild carp shapes not like glamorous body of nishiki-goi but dull bullet streamline. So does this carp. 2. Eyes are small but there are circles around eyes. 3. Pectoral must be depicted precisely, because this is the key point of carp. Imagine the wing of birds. 4. Scales…. your choice. precise or smoothing. I say, just line it. then drip sumi-ink over. What flower do you have in mind on your home land?? I have cherry blossom, because it starts blooming in the spring, which is not only the season for the sun, but for the new school year and fiscal year in Japan. I always remember the first day of elementary school where I could see the water pink colored cherry blossom over the school yard. That is what I recoginize the flower is beautiful. hhh Cherry blossom is the symbol of start, fresh and beautiful for me. How about you?? Cherry blossom could be tough motif for some of you, especially the shape of each flower. Too round looks like the plum and too much oval looks something diffrent. ONe of important technique of sumi-E is "omitting", "cut middle" or whatever you’re saying (sorry, I have merely funny words). I mean, the cherry blossom has five piece of petal but you don’t need paint all of that. Cut off the two, three is enough. "Realism is not that you depict correct but you think it correct. "<- my policy (^_^); The hair of brush must chopped in two so that you can get split top petal of cherry. Then, pistel and stamen.Make solid black on brush. Take one breath moment when you put brush on paper and swing. It gives small black round and soft pistel right in the middl e of the flower. The trunk: Take sumi-ink in the small plate and make thin black ink with water. Put the brush that ink and get solid black ink from the ink stone. Lay the brush horizontally on paper and pull down holding horizontal position. Scar face on the trunk: Before got dry the trunk ink, split the hair of bursh and get black ink, arc line gives like round trunk feeling. Brunch: Brucn got small rugged. It’s been raining since this morning. I have been wondering since kids days the western people are walking in the rain without umbrella. This comes from some films or TV shows I saw in childhood. well, foreigners in Tokyo are seen rarely walking in the rain with no umbrella..
Tha last year when I played golf in the nice London surburb, my long time question happened to melt down. My guess is; when I started at the first hole, it was clear sky fine weather and England green hills are stretching out. It, however, started raining and was getting colder in the middle of the game. Then, when I got hole out, the blue sky returned over my head. …hmmm I thought Europe (I know this expression huge…) especially England (I have not knowledge about Scotland or other places in GBR), the rain is falling in the short period. They know that it will stop raining soon.Therefore people don’t need to bring umbrella. In Tokyo, if it is raining in the morning, it will rain when you come back home. so unconsciously I take an umbrella when leaving home. Or, it starts raining during the day, I will buy a plastic umbrella($3-5). I know I need this all day. 1. In sumi-E painting, the colour of the rice paper is the etreme white. The snowfield is expressed without no drawing, which means the snow will show up the outline. 2. The creek muste be depicted the black which splush out the snow white. 3. Mind the contrast expression will work. See Rembrandt way of painting, he depicts the collar very white. It works to emphasize the face. 4. The black creek streak play a role which takes the viewing eye movement away to the far away mountains. It recalls viewers some memories. Owl for Japanese is "Fukurou". Some loves the owl because "Fuku" reminds us of "Happiness"and collect the owl goods like sculpture or paintings of owl to wish their good fortune. Also, the owl is thought of the gods of the wisedom. We have a famous cram school called Dr.fukurou school. I have seen so many oals which are drawn and painted mostly pretty. I have a positive image on the owl. But, I happened to know that not so many area around the world has the same image about the owl. Let me know the owl legend in your place. 1. To paint the feather of body, would be good way to twist and widen the hair of brush. Use this technique almost all process of painting the oal. 2. The face is round. Keep short strokes and shape the face round. 3. The beak is hard and solid, sticking solidly downward. the most black sumi-ink is needed. Cosmos has bright colour flower with skinny line brunch. That gives us the impression of fleeting in the wind, a littel girl lingered in the field. It might be the reason of this flower popularity. However, the flower is thick and the edge of flower split in two. You might split the brush top or draw twice to depict this thick flower. The pistil is large and round shape in the center. The diversity of the angle of flower face will tell us the wind blowing and the skinny flower are flickering. The angle of face is expressed by the length of each flower. For face up : short down, long up, Face right : left long, right short, Face down : short up long down. One flower must finish to draw with one ink dip so that you can obtain the gradation. On one paper, you should put thick black flower and white flower as well. You should express what you want to tell, with changing the angle and the density of each flower. In the beginning of the summer season, just afeter the blue hydransia had finished its blooming, I found huge white flower on the street down the corner of my house. The rainy season smell was still floating in the air. This is like jellyfish swirling over there. Back in home and chcking the web site, the white large is a "cotton rose ", "confederate rose" or fuyou in Japanese. The summer’s gone. I saw a white flower on the top of a streching stalk beside a pavement near the office. This is called mallow, or aoi (ah-oh-ee). Mallow is smaller than cotton rose and looking for the sunlight like small kids wants candy streching out on the tiptoe. Cotton rose is floating closed on earth like a pale moon rising. At the end of October, Los Angels has lots of red big roses there. It resemble to the cotton flower or hybiscas in Hawaii. The cotton rose leaves are spiky on the edge, very large and thick, and deep green. It tells us they comes from the South. The mallow’s leave are small and grow the quater degree in a clockwise. This image above is named Flower Butterfly, remixing my Tokyo and Los Angels flower expierience of the summer. Pale white flower is wafting down up the sky.